“It is early evening in Paisley with the sun starting to set and we see a variety of Clydeside vehicles including the iconic Routemaster. The following day I set out for Johnstone garage and film a selection of RMs featuring details such as their names, RM fleet numbers and registration plates. It was ‘Rodney the Routemaster’, RM652 that brought about the naming of the Routemasters with boys names beginning with the letter "R", examples including ‘RUDYARD’, ‘ROY’ and ‘RUSSELL’. Despite the boys names we see a young lady driver water RM550 before she takes to the helm! Clydebank was an ever popular place to photograph and film buses with Routemasters operated by Kelvin Scottish on the 5/5A routes. In November and December 1985 two Routemasters were borrowed from Clydeside Scottish to see if crew operation was viable. After the trials an order for Routemasters was placed with London Buses Ltd. and the rest is now history. A visit to Greenock garage shows the number of former London RMs used to provide spares to keep the fleet going. A closer look reveals two Routemasters with the same registration, namely 830 DYE in the yard with adverts on the rear panel and then another 830 DYE in the garage without rear adverts, very strange! At Old Kilpatrick I catch up with RM371, ‘The Golden Retriever’ being brought into the yard for photographs, whilst at the garage a painter is seen applying the new style fleet name (K C B Kelvin Central Buses). At Paisley garage, Clydeside’s ‘Rodney the Routemaster’ gleams in the sun. 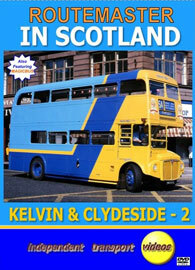 A farewell tour for these iconic buses took place on the 11th February 1990. It is worthy of note that some of the ClydesideRoutemasters carried a triangular grill badge made for the company, comprising of the word Clydeside and the AEC motif. Working alongside the Bristol FLFs, we see RM54 out on training duties. We also see RM17 had a note in the fares cabinet on the platform that said “TA TA! everyone gone for good”. Withdrawn RMs being stored at most of the garages are seen awaiting their fate. Despite all the doom and gloom we take another look at other RMs in service at Buchanan Street, Glasgow and at Clydebank, and a glimpse of the latter Kelvin livery of red and cream. Plenty of action for you to enjoy. Our final scene, however, is of VLT 28, this time it’s a Leyland Tiger with Plaxton Paramount 3200 body leaving on ‘Routemaster’ service 24 for Paisley! A brief visit to the Magicbus depot in Glasgow completes our visit to Scotland”. …So take your seat and enjoy this nostalgic video presentation featuring the iconic Routemaster running in service many miles away for its natural home in London!